KidKraft Dollhouse only $99.99 + FREE Shipping! Home / Deals / Online Deals / Amazon Deals / KidKraft Dollhouse only $99.99 + FREE Shipping! 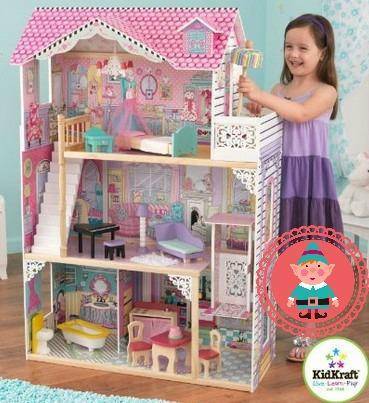 I have a HOT deal for you today on this awesome KidKraft Dollhouse and it is the perfect Christmas Present this year. This great Dollhouse is a HOT holiday item and this is a great price right now at only $99! This awesome KidKraft Dollhouse includes Heart Shaped Latticework, 16 colorful pieces of furniture and a hanging chandelier. This dollhouse is typically priced at $199.99 but right now you can get it for only 50% off at $99 + FREE shipping for Amazon Prime members. This deal will probably not last long at this price, so grab one of these amazing Dollhouses for your little girl today! Photo Gift Bags for the Holidays Only $1 each!